In approaching this idea we engage with the institutional agreement and tacit contract we have made with Parsons through our enrollment in the MFA Fine Arts program. We not only acknowledge our realization of the benefits and particularities that arise through such an arrangement, but we embrace the revitalization of our diverse practices, renewed critical engagement with our present environment, and an openness to re-educate through our own self-fashioning. The chalkboard is a symbol of education, and the blankness of a new chalkboard represents possibility.We are using the chalkboard as a place for each artist to choose what the chalkboard stands for in his or her own educational context. Thus we will creatively re-figure chalkboards to transmit our practice and ideas. Each student will negotiate this conversation with the institution as it relates to his or her own practice. 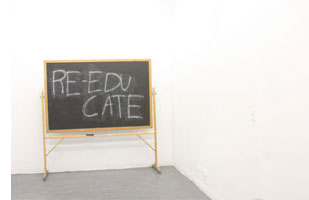 Everyone will perform with the material chalkboard, uniquely and personally, through the shared concept of re-education. Every student in the entering class of 2012 in the MFA Fine Arts program will be invited to participate; There will be a wide variety of different negotiations and conceptual renderings.